First place in their initial stage groups contrary to expectations, the combination of Moldova’s Vladimir Ursu and Slovenia’s Aleksandra Vovk, alongside their European colleagues Azerbaijan’s Yu Khinhang and Ning Jing, continued to cause upsets as play commenced in the opening round of the Mixed Team event on Sunday 14th October. Both caused the Pan American continent pain; each recorded two matches to one victories. Vladimir Ursu and Aleksandra Vovk, the no.24 seeds, defeated the combination formed by Chile’s Nicolas Burgos and Puerto Rico’s Adriana Diaz, the no.7 seeds; soon after Yu Khinhang and Ning Jing, the no.22 seeds, ended the hopes of the United States by overcoming Kanak Jha and Amy Wang, the no.5 seeds. The success secured by the European duo was gained in dramatic circumstances; the closest contest of the event to date. After Adriana Diaz had beaten Aleksandra Vovk (11-6, 11-6, 11-5) and Vladimir Ursu has accounted for Nicolas Burgos (19-17, 11-7, 7-11, 11-9), the doubles went to the wire. Vladimir Ursu and Aleksandra Vovk emerged successful by the very minimal two point margin in the deciding game, withstanding a brave recovery by the Latin Americans (11-6, 11-6, 7-11, 9-11, 12-10). A vital doubles contest to determine the outcome; it was the same in the contest between the United States and Azerbaijan but not with such a tension packed ending. However, that was not the situation in the opening encounter, the duel that with the benefit of hindsight was to prove vital; by the very narrowest of decisions Ning Jing beat Amy Wang (11-4, 13-11, 4-11, 2-11, 12-10). Kanak Jha followed by beating Yu Khinhang (8-11, 15-13, 11-6, 11-6) to set the scene for the deciding engagement. It appeared a contest that was too close to call; the Azerbaijan duo had different ideas, they won in straight games (11-7, 11-2, 11-8). Full distance wins, in the two remaining contests that completed the fixtures in the top half of the draw; there was no need for a deciding match. 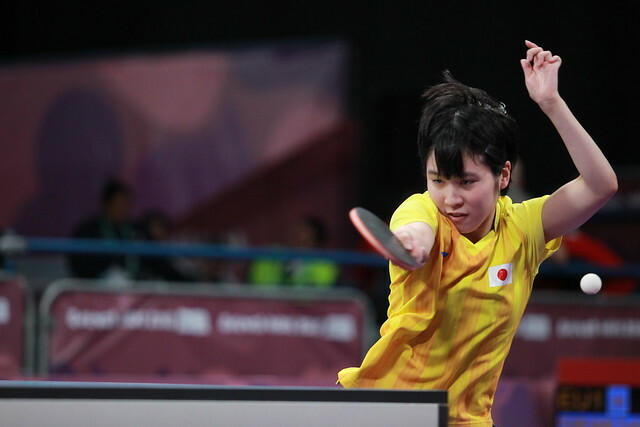 Japan’s Tomokazu Harimoto and Miu Hirano, the top seeds, recorded a two-nil win against Ioannis Sgouropoulos of Greece and Nadezhda Bogdanova of Belarus, the no.14 seeds, as did the third seeded outfit formed by Sweden’s Truls Moregard and Serbia’s Sabina Surjan, when facing Italy’s Matteo Mutti and Jamila Laurenti, the no.16 seeds. At the quarter-final stage Tomokazu Harimoto and Miu Hirano face Yu Khinhang and Ning Jing, Vladimir Ursu and Aleksandra Vovk oppose Truls Moregard and Sabina Surjan; the contests will be enacted later in the day.